We carry out a lot of work to help us understand the environment authors work in today and the challenges they face. We commission independent research into authors’ earnings and the attitudes of consumers towards the online environment and we produce research that contributes to wider authors’ rights debates. 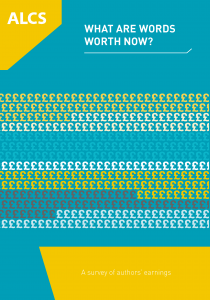 We commissioned CREATe at Glasgow University to conduct independent research into authors’ earnings in the UK today. This updates our previous research published in 2007 and 2014. You can read the 2018 research here. 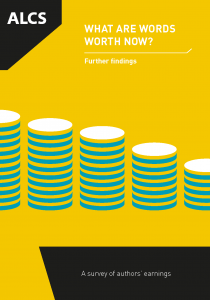 Further findings from the report we commissioned into authors’ earnings and the writing life. We commissioned Queen Mary, University of London, to conduct independent research into authors’ earnings in the UK today. The aim was to get a true picture of authors’ earnings and update our previous research, published in 2007. You can read the 2014 research here. 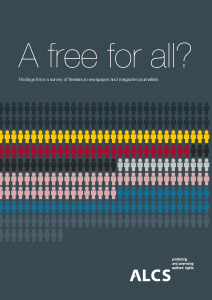 We also commissioned Loughborough University to carry out a survey of 1,250 freelance newspaper and magazine journalists to find out more about their income, working practices and rights over articles. Download the research.